These unique, two tone (gold and silver) sterling silver earrings feature the traditional Greek Key Motif, also known as the Meander or eternity symbol, fashioned in a stylish round shape. These are hoop earrings, with a fish-hook silver post. 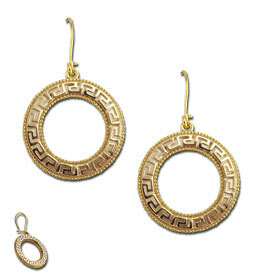 These earrings feature high quality 18k Gold Plating on the gold portion of the earring and its hoop. Wear these with a matching necklace!